Raising and racing quality New York breds. 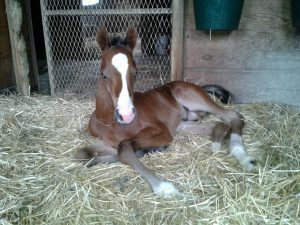 Haven Oaks Farm provides a wide variety of services to support your breeding and racing needs. We are a small operation so, your horses will receive individual attention every day. At Haven Oaks we know the temperament and individual quirks of every animal. We evaluate their health and well being on a daily basis. Owners/managers Jim and Sue Hooper live on site and direct every aspect of your horse’s care. Our large, grassy paddocks are fenced with safe, Centaur fencing. Quality feed and hay are provided along with supplements, as needed. Stalls and paddocks feature heated automatic waterers. Rates are commensurate with the needs of the individual horse and owner. The broodmares at Haven Oaks receive the special attention they require to conceive and carry a vigorous and healthy foal to term. Only top quality grain and hay are fed. Late term mares are observed in video monitored foaling stalls and turnouts and farm owners Jim and Sue attend every foaling. Mares and foals are handled daily. Foals are haltered and led to and from the barn every day. They are handled extensively to assure they are well socialized and prepared for future training. We do our own shipping for breed and return covers at most upstate New York farms. Haven Oaks can provide a variety of rehabilitative services including layups, post-surgical care and physical therapy. We will work closely with your veterinarian or ours to provide a strict regimen of care. Rehab procedures are charted and strictly monitored to assure adherence to prescribed orders. Our post-surgical return to racing record includes graded stakes winner, Inherit the Gold. 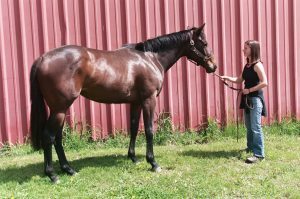 Whether you are sending your weanling, yearling or broodmare to the sale, we will get your horse in condition to catch the buyer’s eye in the ring.